I have a growing need to simplify, bring greater calm and positive thoughts into my own life. Like Thoreau, I too yearn to “simplify, simplify”. I once read somewhere that creativity flows from a quiet mind. It’s true. I’m at my most creative when my mind is calm and not full of clutter. Each time I’m frustrated with my progress or substandard efforts, I’ve learned to bring my attention to what is producing the static and disturbing my thoughts. Anger, remorse, worry, anxiety, fear and, sadness are all factors that get in the way of creating. These emotions are human but it is what we do about them that determines who is enlightened and who is not. Being all too human myself, I struggle on a daily basis to reach for that higher level of being. Nothing helps me in this endeavour more than the garden. A good hour of weeding has on many occasions resulted in solutions for conflicts or concerns. A more physically demanding chore like pruning, digging or mowing gets rid of negative energy and anger. I turn to relaxing tasks such as watering and deadheading to comfort me when I’m feeling blue or tense. Certainly, any length of time spent in nature is restorative. Nature unfailingly inspires in me a need to be and do better. However, sometimes, it is other people’s negative energy that thwarts one’s own efforts. For those who live with me, I’m known to send them and their bad moods into the garden to take care of some chore or other. I’m yet to be disappointed by the change when they return. Nothing short of a miracle. But I’ve been thinking further. Consider elements that always serve a noble if elusive purpose. They are fun to boot. How about mazes, labyrinths and tunnels? Any one of these brings a consistent sense of curiosity, wonder and humor into our everyday lives. A childlike openness to the possibilities of magic and imagination. I doubt anybody can resist walking through a maze, labyrinth or tunnel. The challenge of finding one’s way out of a well designed maze ellicits a feeling of giddy excitement tempered with a mere hint of fear. I remember my visit to that famous maze at Hampton Court, England. We were three adults and one child. It took us a while to find the exit but the fun we had is still vivid in my mind. Labyrinths are a bit different. While irresistibly calling to be walked, it magically makes the walker slow down and focus on the path itself. Pretty soon, the mind is calmer and the breathing deeper. On completion of the circuit, the person is in an entirely different, more deliberate state of being. 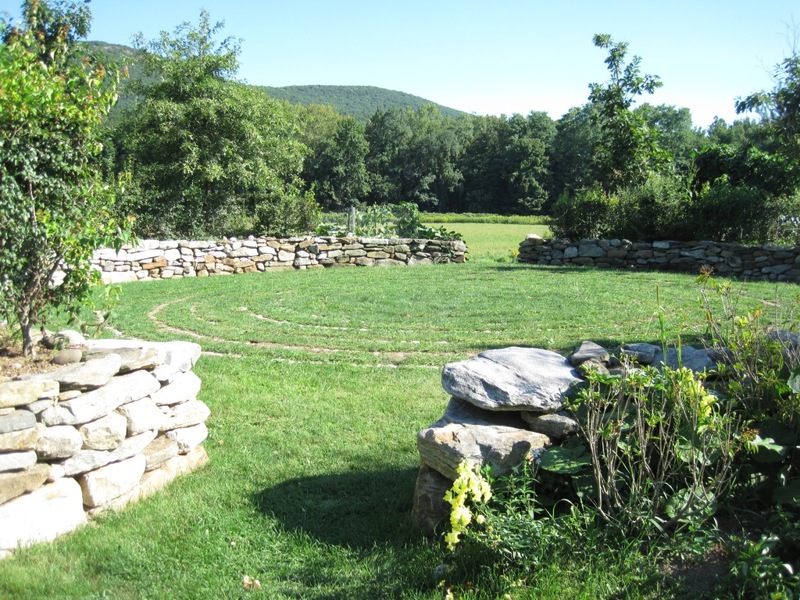 I have discovered a lovely labyrinth on our frequent drives to southern Vermont. It belongs to a church but is very much open to the public. I cannot emphasize how much it means to me visit this place every time we’re passing by. Similarly, last summer, we visited the Heritage Museum and Gardens in Cape Cod. 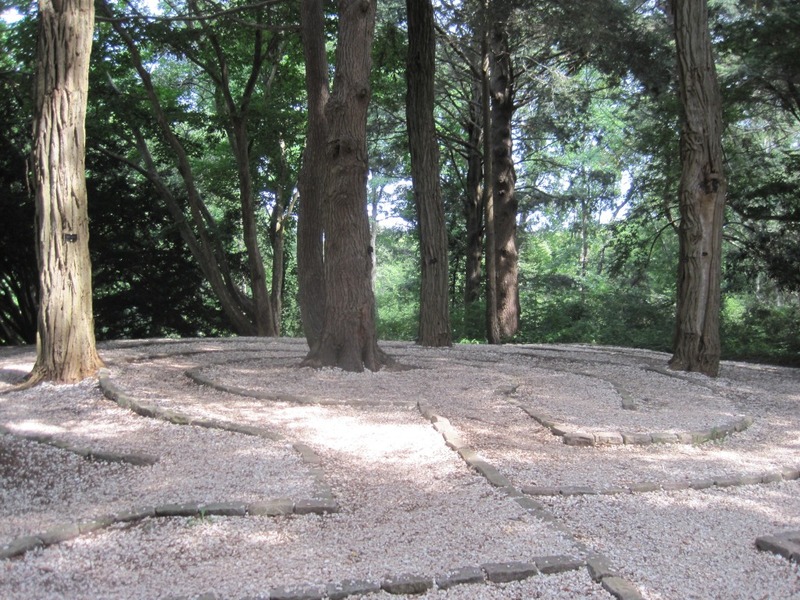 Here, the labyrinth was bigger and contained mighty trees that seemed to stand like sentinels safeguarding both the spirit of the place as well as those who entered it. I watched children who started out running and then gradually quietened down as they followed the purposefully laid out trail. Tunnels in gardens are rather interesting. They needn’t be long at all. Simply entering one spurs the imagination.What it guides you through and leads up to can be quite exciting. I’ve walked through wisteria tunnels that were heady with scent, laburnum ‘walks’ that cast an other worldly golden light and then the one in Giverny so strewn with bright orange nasturtiums scrambling all over the path that one was forced to look down the whole way. You emerge from a tunnel with a renewed appreciation of freedom. It is plainly impossible to ignore any of these elements in a garden. 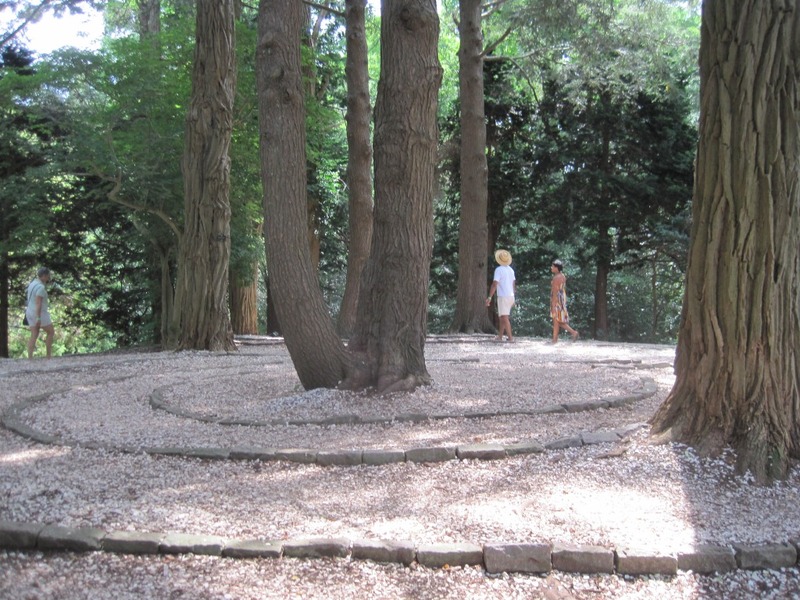 So, how come there are hardly any private gardens with a maze, labyrinth or tunnel? They are not as complicated as they might seem. The upkeep need not be costly. So many options come to mind! My own garden precludes them due to the lay of the land but believe me, I’m thinking very hard about it. One day in the not too distant future, such a feature might just be added. Meanwhile, here is a suggestion, okay it’s a fantasy of mine – consider a maze or labyrinth that must be traversed to get to one’s front door. A perfect antidote for those coming home from stressful hours at work or fighting heavy traffic or simply in a foul mood from real or perceived problems. Imagine a teenager returning from school full of typical whines and tales of woe. By the time they get through this imaginative ‘walkway’, they’ll be in a kinder, gentler state of mind. It’s as though you put out a big sign saying – “ Leave ill-tempers and negative thoughts at the door please”. I do believe, certain unwanted solicitations and pollsters would be reluctant to attempt stopping by. It gets better and better! Tunnel of wisteria underplanted with lavender. Nasturtiums almost covering the path. 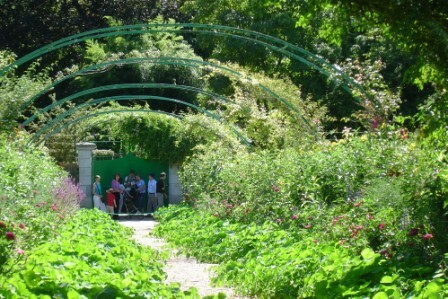 Giverny. Lovely interplay of light and shadow. 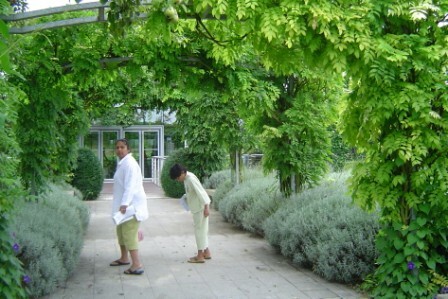 This entry was posted in Deep thoughts, The Garden Demystified by shobha. Bookmark the permalink. 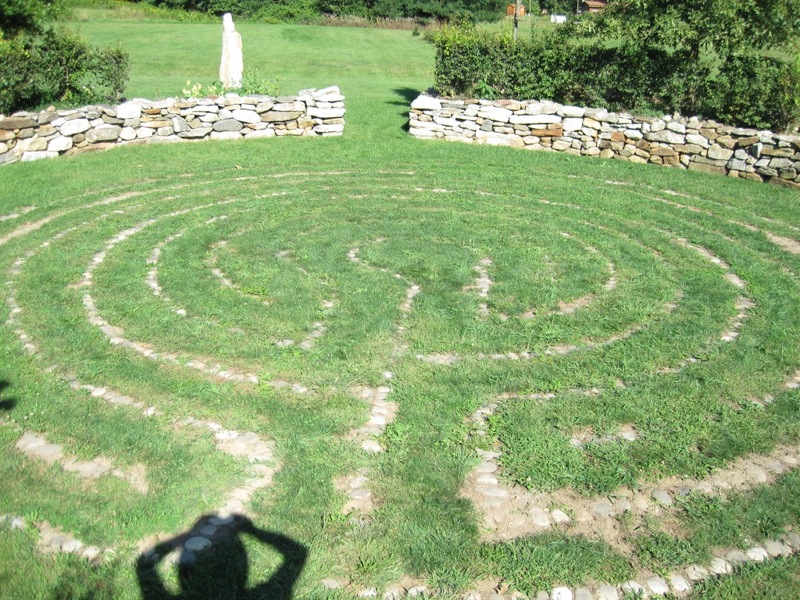 There’s a simple labyrinth in Block Island with breathtaking water views. Thank you for the welcome reminder.